When you are about to design your living room where all the family members gather to do different entertaining activities and enjoy discussing issues together, you have to decide what style suits your taste perfectly. If you want to feel warm and familial atmosphere with beauty and elegant look, the traditional one is the best one to fit your needs and taste. 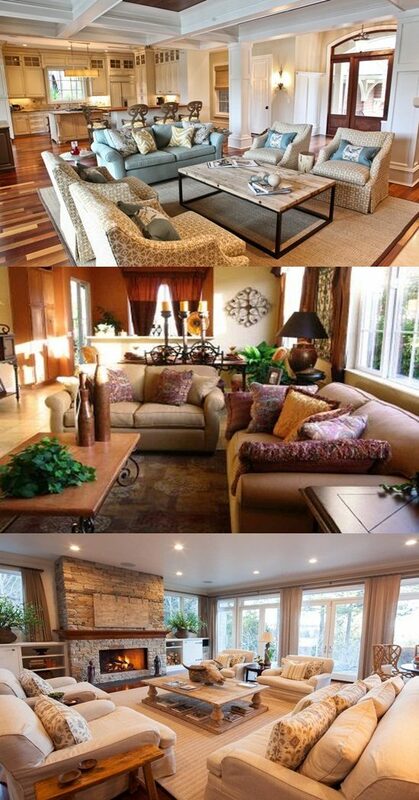 The traditional living room is easy to be designed with simple steps to get a stylish and warm room as well. First, you should pay attention to the color you want, the traditional style is characterized by the earthy tone and warm shades. The color includes everything in the room from the wall to the floor and furniture. You should contrast them all perfectly to add the traditional warm touch. These colors should be bright colors too because it is the room where you will experience the family spirit with laughter and the gathering of all the memories. Yellow, red, orange or cream, brown can go well with the traditional style. After you have already decided your color scheme, it is time to look for an appropriate furniture which has to be comfortable and elegant as well. The wood is the key element within the traditional style. The traditional furniture varies in shape, design and the wood type. The dark wooden furniture which is durable, good quality material and elegant is the perfect one for the traditional living room. The dark wooden furniture can have some artistic engravings which will add a unique and elegant look. The traditional furniture is numerous as sofas, chairs, table and so on. The traditional living room has to be well illuminated by the right light fixtures to be comfortable place with warm atmosphere. The Carved Candlestick Wood Lamp will be ideal for your living room tables and will add elegant touch too. Don’t forget the amazing touch of the other accessories like area rug, throw pillow, wall art pictures, flower vase, etc. With these simple steps and with your research online or via magazines, you can create your dream traditional living room.